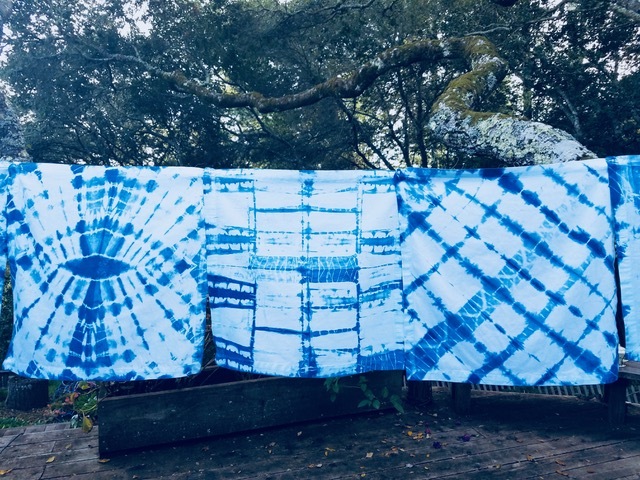 This class explores the history, and revered tradition of Shibori: Japanese indigo dye. Participants in this class will learn three different Shibori Resist Fold Techniques. Each person will receive silk and cotton fabric to create one of a kind pieces, additional fabric will be available for purchase. Sign up today to learn more about this ancient tradition! As a multi-media artist, Priscilla Troy has enjoyed experimentation with a wide variety of textiles. She designs and refreshes antique parasols and manufactures handmade bamboo parasols for fashion, wearable art, and sun protection through her company, Priscilla’s Parasol and on Etsy. Pricilla teaches after school art at Nicasio School and is a member of Marin Art Teachers Association. Additionally, she conducts creative workshops in art making with fibers and living plants.